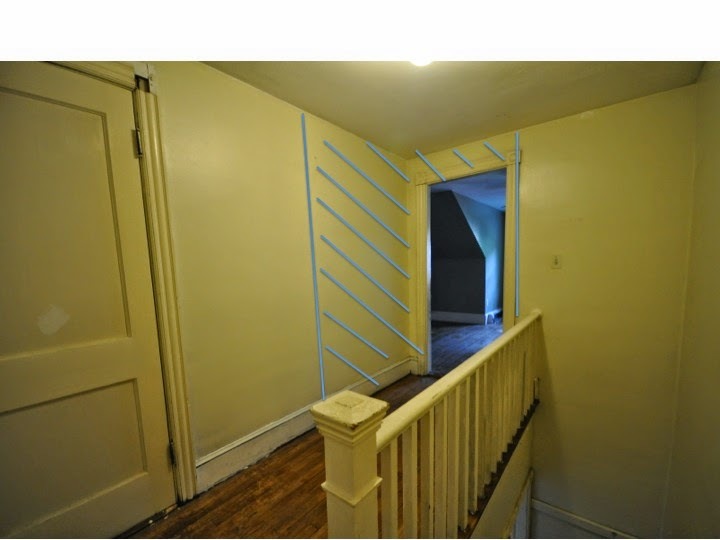 The Demo Team is ready to go, so that put some pressure on us to finalize the floor plan. So, here's the starting point. As you probably noticed from the 'before' photos, the first floor units are mirror images of one another. And these are big units! The first floor of the building is almost 2000 square feet, so we have lots of space to work with. The City records show the Owners Unit with 3 bedrooms. And the Tenants Unit with 2 bedrooms. But in reality, they each have one more bedroom than that. So that's the challenge. Should we have more bedrooms? Or not? Some of the most helpful advice came from a local landlord who reminded me that more bedrooms is perfect for renting to college students. Ah.....I used to be a college student and I wouldn't call myself an ideal tenant. Unless you like the idea of loud parties, no yard upkeep and poor housekeeping. So, after mulling that over for awhile and taking into account our unique mix of 1st and 2nd floor bedrooms, we decided to stay with the number reflected in the City documents. But, and this might seem crazy, I hate the idea of keeping these units identical. The needs of the residents will be different, depending on the number of bedrooms. With the changes we're making, it gives us the opportunity to make each one unique! We just want to meet our primary design criteria: create an open floor plan, while integrating the kitchen with the living space as much as possible. Now, there are some key differences between the two units! Let's start with the Owners Suite - it will have a very large living room, since it has more bedrooms (and in theory) more people. The new living room will be 24' x 12.5'! We took the extra bedroom and used it for the dining room - which is open to both the living room and kitchen. Don't you think it will be great once these walls are removed? We will also made some big changes in the Tenants Unit. I hated to do it, but we plan to eliminate one of the vintage built ins. We will move the other one to a more central location, which will create a feature point as you come from the living room. 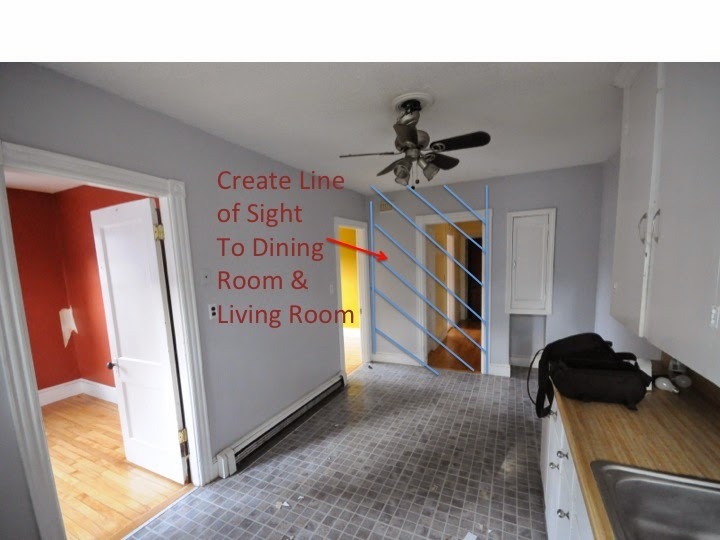 These changes will allow us to open up line of sight from the kitchen to the living room and dining room, making the space feel much larger and friendlier. No more being stuck alone in the back of the house while you're cooking! We will also eliminate the narrow closet between the two small bedrooms and create one large bedroom. So, although we'll only have 2 bedrooms in this unit, they will both be large with their own bath! And again, this will now be a big room - 23' x 11'. And while there were a lot of similarities on the first floor, there are a lot of differences on the 2nd floor. 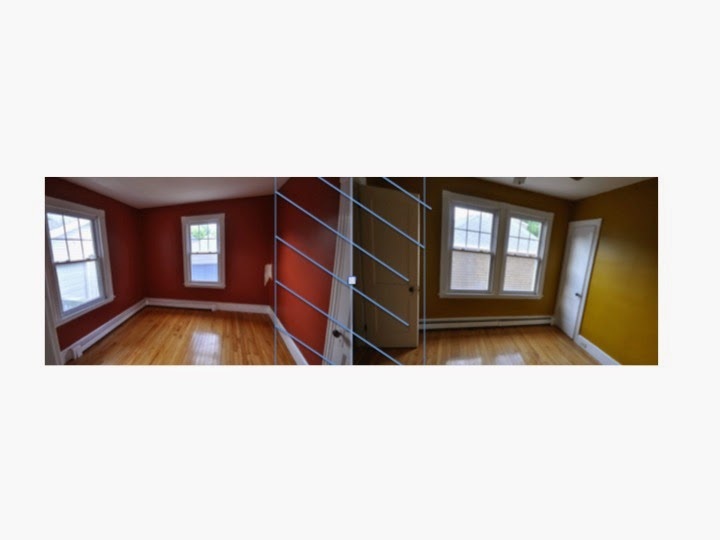 The Owners Unit has 2 bedrooms - one a large Master Suite with its own bath and a door to the back stairway. The Tenants Unit also has a bedroom, but there wasn't much else on the 2nd floor. In the Tenants Unit, we're going to change all that! We are taking more knee wall space and dramatically enlarging the space to create a true Master Suite on the 2nd floor. The bedroom gets much bigger, with a large closet. And a full bath will complete the space. Won't it be great to eliminate this wall and open up this space? And we're adding two new skylights to flood the rooms with light. The biggest change for the Owners Unit? We are adding a large walk in closet, opening up the existing bathroom to make it feel more spacious (with a nice big new skylight) and adding a private deck off of the back door. It's going to be a beautiful, large suite! What do you think? We can't wait to get started! I think it's more natural to have the kitchen, dining, and living room (all the public, living spaces) in line and open to each other. 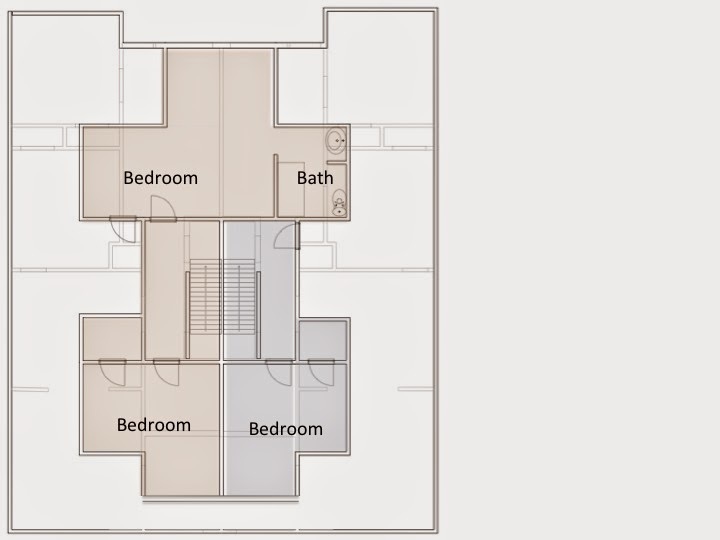 It makes more sense to have the one room out of line from the others in the floor plan be the bedroom, which you'd want to feel separate from the public living spaces anyway. It's also more natural to have a bedroom off a hallway rather than off the dining room. The hallway will also add to the feeling of separation because you have to go through another space (the hallway) before you can enter the bedroom. 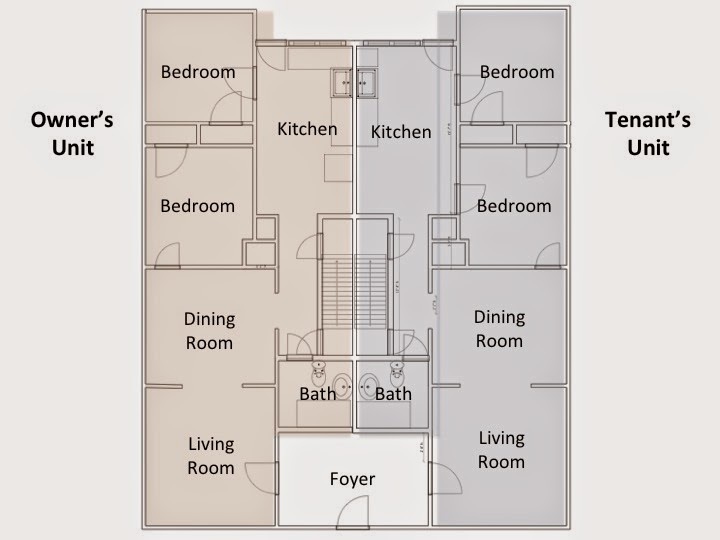 Also, this way, the kitchen has all those exterior walls (and therefore windows) -- if a room is going to be sort of dark, it makes more sense for that to be the bedroom where lack of light can actually be a plus. And now the bedroom is not only insulated from the living space activity by the hallway, but also by the bedroom closet, the fridge, and the kitchen storage. That'll be a real bonus for roommates who have different schedules -- one may be sleeping while the other is cooking or having visitors. I agree with having the kitchen in line with the dining room and living room. Although there are costs to consider, making the kitchen and bedroom change places would be good. Were you planning to re do the kitchen? I love the idea of having all the public spaces in a row! But it would be prohibitively expensive. 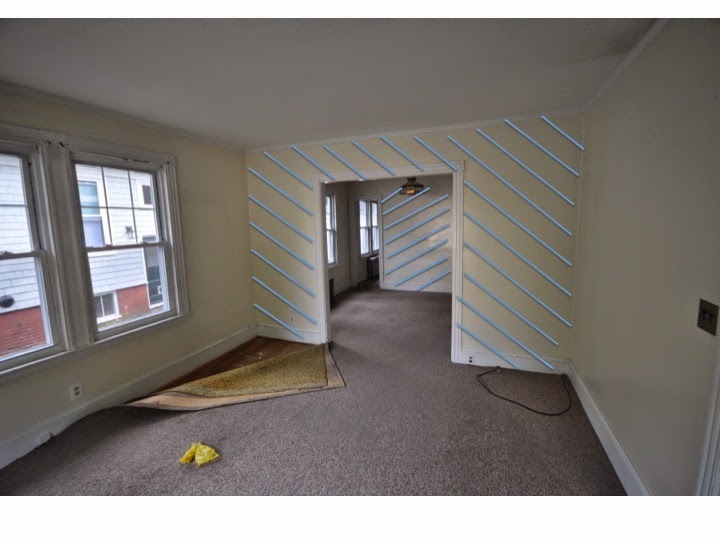 We would need to redo all of the plumbing, replace the current windows with shorter ones (kitchen countertops are taller than the current windows), find replacement siding to fill the gaps on the exterior from the smaller windows, move the back door (which currently has a nice overhang, keeping you dry if you come in during a rain/snowstorm), etc. Having back to back kitchens saves us a lot! 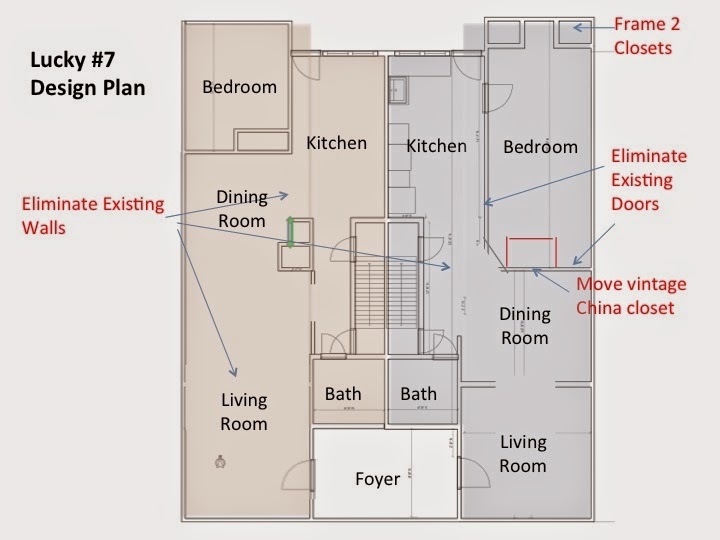 I think this actually really improves the open layout, since all three areas -- living, dining, and kitchen -- would have a bit of a defined nook to occupy while still being totally open to each other. Plus now the kitchen can benefit from all the light coming through the original bedroom windows. This also enlarges the bathrooms a bit. The caveat is that you'd have to change the front entrance, but I think the current foyer windows are already where you'd want to the doors to be, so that helps make that an easier change. Sorry, apparently I find floor plan tweaking very entertaining, and I've had a lot of free time this week since finishing a huge project last week. So in case you are STILL noodling around about this, I had a brainwave about the downstairs bathrooms. http://i.imgur.com/SZphWlW.png Since you are adding a bathroom upstairs, you could put another bathroom immediately below it with the same configuration. You have to run those pipes and electrical anyway -- might as well get twice the bang for your buck! 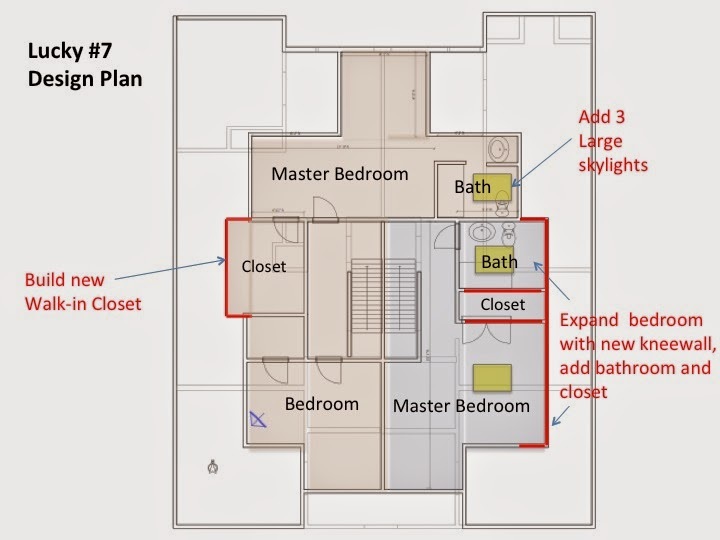 This means the owner's unit can annex all the original bathroom space and end up with a nice, big bathroom. This location for the owner's downstairs bedroom also makes it work just as easily as study or office, which a lot of people like their guest rooms to double as anyway. The new bathroom in the tenant's unit sort of divided things in a way that made two bedrooms on that floor make more sense. And hey, more bedrooms = more rent money, right? I think you're as addicted to this as I am!!! 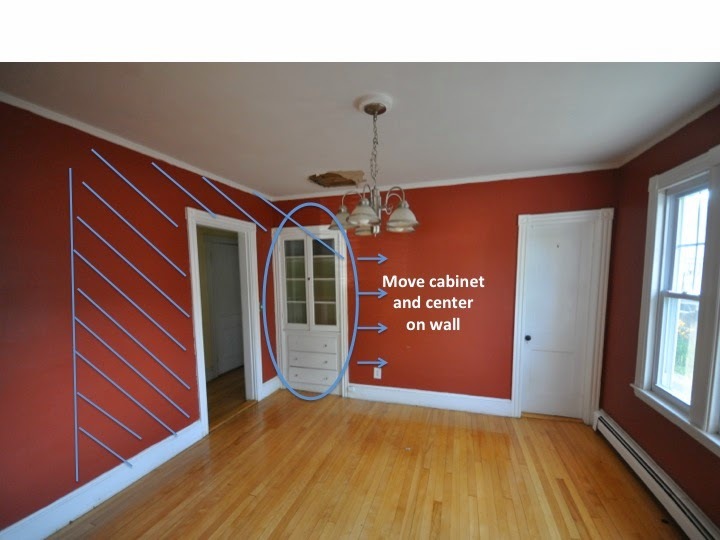 I love how you've moved things around, but now that we've decided we're redoing the Owner's Kitchen, there's no way our budget could cover moving so many bathrooms. That's a lot of plumbing costs! But thanks for thinking through so many ideas.